Start your review of Brad Onifrichuk . Send a message to Brad Onifrichuk . Thank You! Your message has been sent to Brad Onifrichuk at Whitby Oshawa Honda. 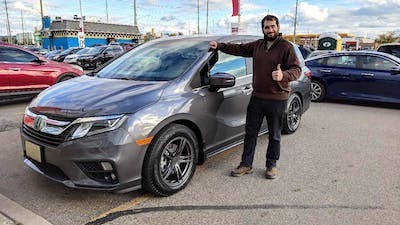 "Stress free, rewarding purchase experience"
I've been a past customer of Whitby-Oshawa Honda and when it came time to purchase another vehicle I didn't hesitate to give Nick Mohr a call. At our initial meeting in January, Nick and I discussed what I was looking for in a vehicle and narrowed the search. It took a few months and test drives to find the vehicle best suited to my needs with Nick providing great advice and demonstrating nothing but a high level of professionalism along the way. We concluded the deal on the new vehicle on snowy Saturday in March and my wife and I are extremely pleased with our purchase. Thanks for your patience and guidance Nick! We'll be back soon to work with you on replacing our second vehicle. "Another Awesome Experience, Thanks To Adam Rumball"
This is not my first dealing with Adam. I had two previous interactions with Adam, one that resulted in a sale and one that didn't. Adam left a very good impression for me and I found him to be very determined in making sure that I get the best possible deal. So coming back to Adam is a natural step. This time around, I am looking at my options as I am close to the end of my lease. Adam listened to my need and concerns and patiently helped me in looking at different options. When I finally decided on getting into a new car, Adam provides guidance and fight on my behalf to make sure that I get the deal that I wanted. Thanks to his persistence and perseverance, he was able to get me the deal that I wanted, Long story short, I am a happy customer with a new car. For sure, I will be looking for Adam when my new lease is up. Thanks Adam!! Just bought a new Accord and they were great. Dan and Brad, specifically, were very easy to deal with. No high-pressure sales tactics. Just very willing to work with you to get a deal done. Very happy with my experience and absolutely would recommend him! "Very professional, and helpful "
"Lease of New 2018 Civic"
Went into the dealership on a Saturday with an appointment to see a particular salesperson. However they were busy so Jess Knuth was able to help me. She was very patient and not pushy at all. Jess was very knowledgeable about the different options and trims. She was more than happy to take me for a test drive. She helped me through the process in a time efficient way as well. After I ended up purchasing and taking delivery she has always been available in case I have any questions or concerns. A+ service from her! In all my years buying new vehicles, Whitby-Oshawa Honda is the only dealership in which I've felt they care more about my family and I than completing a sale. Always friendly, helpful, and willing to work to my personal needs and requests, I've never finished my visits here with anything but a smile on my face and an overall sense of excitement about what just transpired. I can't imagine ever buying a car anywhere else, I've bought three here now. Highly recommended, five stars. "Our lease purchase of 2018 Honda Accord Touring "
We would like to thank Tony and Anthony Siva; and Keishauna for making our experience a very pleasant and smooth one. We feel like part of the family and would highly recommend any of our friends and family to Whitby Oshawa Honda. Their knowledge, expertise and friendly attitude made it a relaxing seamless process. Also thanks to Brad for his assistance with the leasing. Jason was a pleasure to work with. He was prompt, funny, courteous and patient! I was always greeted with a smile from all the staff at the Dealership. I knew from the first time i went in, that I would be well taken care of. They all made my first car buying experience a breeze! Ive had my Honda - I call him Elliott James (El.J for short) for about a week. He runs beautifully and handles my long commute well. OSHAWA WHITBY HONDA has so many other great cars in their inventory. You should definitely make a stop here first!